Ocean Sans Std Bold Ext font family series mainly provide Italic,Regular and other font styles. 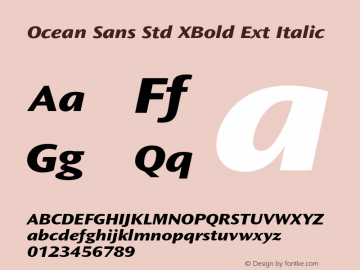 Ocean Sans Std XBold Ext font family series mainly provide Italic,Regular and other font styles. Ocean Sans Std Bold SemiExt font family series mainly provide Regular,Italic and other font styles. Ocean Sans Std Light Ext font family series mainly provide Italic,Regular and other font styles. Ocean Sans Std Book Ext font family series mainly provide Italic,Regular and other font styles. Ocean Sans Std Semibold Ext font family series mainly provide Italic,Regular and other font styles. Ocean Sans Std Book SemiExt font family series mainly provide Italic,Regular and other font styles. Ocean Sans Std Bold font family series mainly provide Italic,Regular and other font styles. 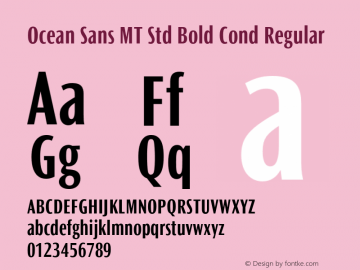 Ocean Sans MT Std Bold Cond font family series mainly provide Regular and other font styles.